Here is young Sam Clemens—in the world, getting famous, making love—in 155 magnificently edited letters that trace his remarkable self-transformation from a footloose, irreverent West Coast journalist to a popular lecturer and author of The Jumping Frog, soon to be a national and international celebrity. And on the move he was—from San Francisco to New York, to St. Louis, and then to Paris, Naples, Rome, Athens, Constantinople, Yalta, and the Holy Land; back to New York and on to Washington; back to San Francisco and Virginia City; and on to lecturing in Ohio, Michigan, Pennsylvania, and New York. Resplendent with wit, love of life, ambition, and literary craft, this new volume in the wonderful Bancroft Library edition of Mark Twain's Letters will delight and inform both scholars and general readers. 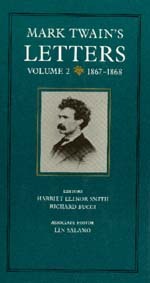 This volume has been supported by the National Endowment for the Humanities, the Mark Twain Foundation, Jane Newhall, and The Friends of The Bancroft Library.